England retained the Ashes on a wet afternoon in Manchester. Rain was forecast for the final day, but arrived at just the right time for England, with Australia threatening to muster the spirit and passion to skittle England out inside a day to keep the series alive. Superb pace bowling from Ryan Harris, Shane Watson and Peter Siddle accounted for the wickets of Alastair Cook, Jonathan Trott and Kevin Pietersen in the morning session. Joe Root was dropped at slip, the final day villain being Australia's opening day hero, Michael Clarke. Pietersen was seething after his dismissal, convinced he hadn't nicked through to Brad Haddin. After his brilliant first innings was cut short by a bad DRS decision, this Test may have mixed memories for Pietersen. With Ian Bell and Joe Root attempting to stop the rot, England looked vulnerable when lunch arrived and the black clouds settled over Old Trafford. There was an attempt to restart in mid-afternoon but it was apparent that the weather was unlikely to improve. Play was abandoned at 4.30 and the match declared a draw. The remaining Tests, beginning at Chester-Le-Street in four days, will see England attempting to secure a convincing series win ahead of this winter's return engagement in Australia. There may be a temptation to experiment with their bowling line-up. Chris Tremlett and Graham Onions may come into the reckoning. Tremlett, with his height and pace, will be a particularly valuable weapon on the Australian wickets. "The weather hasn't been ideal, but we're feeling good in the dressing-room," England captain Alastair Cook said. "Australia put us under a lot of pressure but we responded well. It has been stressful, and a challenge, but that is always heightened in the Ashes." 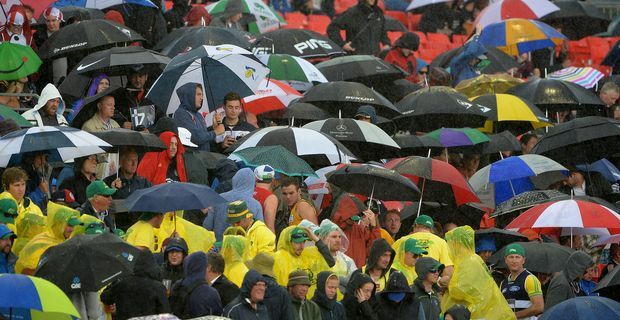 Meanwhile, Australia showed enough talent and spirit at Old Trafford to offer them hope of winning back the Ashes on home soil. In Harris they have a bowler right out of the old school, fiery, aggressive and cunning.